I don’t often enjoy reading ‘‘How to figure yourself out’’ books but this was an exception. 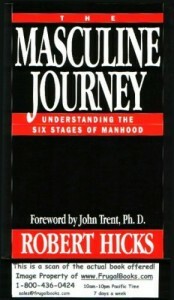 Maybe it was because it is a word study of the six Hebrew words for ‘‘man.’’ Hicks relates each word to a significant stage in every man’s life, not by building a lexical definition, but by showing how each word is used to describe men of the Old Testament in different ways at different times. ‘‘Adam’’ is the creational male, finding his humanness and manhood. ‘‘Zakar’’ is the phallic male, struggling with the fact of his sexuality. ‘‘Gibbor’’ is the warrior male, competing and striving to outdo his peers. ‘‘Enosh’’ is the wounded male, struggling through the disappointments and wounds of growing. ‘‘Ish’’ is the mature male who knows where he is headed and goes for it. ‘‘Zaken’’ is the sage, the mentor, the ‘‘gray-headed’’ wise one. I found the book useful for me as well as for my teenage son. We all do better when we see the over-all picture of where we’ve been and where we need to go.